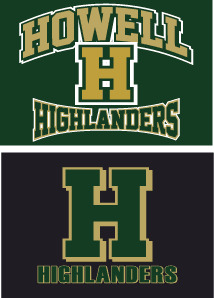 HOWELL HIGHLANDERS apparel and accessories are now available to order online! VERY IMPORTANT: ALL ITEMS ARE MADE SPECIAL TO ORDER AND MAY NOT BE RETURNED FOR SIZE EXCHANGE OR FOR REFUND. PLEASE BE SURE TO ORDER THE CORRECT SIZE. For help with sizing, there is a sizing chart on the page of each individual item. THIS IS A FUNDRAISER FOR THE HOWELL H.S. ATHLETIC BOOSTERS TO HELP SUPPORT THE ATHLETIC PROGRAMS AT THE SCHOOL. DEADLINE FOR CHRISTMAS DELIVERY IS NOVEMBER 25th. Please note that we CANNOT GUARANTEE delivery estimates. This estimate based on normal order processing without product back orders or unforeseen production delays. We will always do our very best to meet this delivery estimate. You may customize most items with a name on the back of shirts at additional cost. All items available for customization will have a "ADD NAME" box designated. Please be sure to include the correct spelling of the name you would like. 1. Select "In Store Pick Up" - When your order is ready, it will be distributed to you through the Howell Athletic Boosters. 2. Select "US MAIL" to have your order mailed directly to address listed on the order form. Shipping charges will apply for this option. (cheapest home delivery option). 3. Select "UPS GROUND" to have your order shipped UPS GROUND SERVICE to the address listed on the order form. Added shipping charges will apply for this option (normally more expensive than USPS mailing). Email: please email us through the contact page on this site.